Sam's Club or Costco: Which Has Better Prices & Services? Deciding whether to join Costco or Sam's Club is no small task. Both warehouse giants offer an array of discounted goods and services including grocery items, prescription medications, electronics, automotive supplies and services, and more. Both also promise exceptional deals compared with conventional retailers. Which, if either, is the better choice? We became members and shopped at each to find out. To compare Sam's Club and Costco prices, we shopped for a family of four, including an infant, at stores in the same Dayton, Ohio, market area. Into our cart went 30 perishable and packaged grocery items, personal care products, and other household essentials. Item for item, we tried to pick the same brand in the same quantity at each wholesale club. We also calculated the price per unit — per ounce, per diaper, etc. — to account for differences in package size. When possible, we selected in-house brands (Member's Mark and Daily Chef at Sam's Club and Kirkland Signature at Costco). Nearly half the items cost essentially the same at both stores (less than a 1 percent difference in unit price). Seven of the 30 items came out cheaper at Sam's, by an average of less than 8 percent. Costco bested Sam's Club's prices on nine products, with average savings of more than 11 percent. The super-size packages of many items at wholesale clubs may deter some consumers, especially those with few family members or lacking lots of storage space. At both stores, for example, American cheese comes in 5-pound packages — can you eat that many slices before they expire? Such large amounts are no doubt useful for parties, daycare centers, group picnics, and big families. Our hypothetical family of four would find a Sam's Club or Costco membership most valuable for stocking up on cleaning supplies, paper goods, condiments, baby supplies, and grocery items that won't spoil anytime soon. For consumers worried that bulk buys will go to waste, it's worth noting that in the cases where package sizes differed, Sam's Club more often sold a smaller quantity. If you join just one warehouse club, assess your needs against each retailer's strengths and inventory before making a choice. Both Costco and Sam's claim large followings, and consumers seem to have their loyalties. Costco boasts more than 96 million cardholders spread across more than 52 million households, and Sam's Club has about 47 million members. We found few online reviews of the warehouse clubs overall; those we did find focus mostly on a particular product or service. We considered this user feedback in our evaluation of the two stores, informally polled consumers online, and noted the results of broader surveys. We also relied heavily on our own shopping experience in declaring a winner on a variety of fronts, from prices to pharmacy to return policy. Both warehouse clubs have two membership levels. Costco offers separate household and business memberships within those tiers, while Sam's Club has streamlined its membership options to only two. The basic membership at Sam's Club costs $45 a year and allows up to eight add-on memberships for $40 each. At Costco, a basic Gold Star membership costs $60 a year and is for household use only. A Costco Business Membership, also $60 a year, allows for additional cardholders ($60 each) and lets shoppers resell merchandise. For $100 a year, a Sam's Plus membership returns $10 for every $500 spent on qualifying items, up to $500 a year; grants extra savings on select prescription drugs without insurance; and allows up to 16 add-on memberships for $40 each. Plus members also get early-bird shopping hours and free shipping on most items with no minimum purchase, a new benefit. Costco's Executive Membership, which costs $120 a year, provides extra savings on available services, plus 2 percent back on qualified purchases, including travel, up to $1,000 a year. Costco's Executive Business Membership (also $120 a year) includes cash-back benefits as well as additional cardholders and resale. Bottom line: Sam's Club memberships are cheaper, but the higher fee at Costco might be a good investment for shoppers who take advantage of the club's wider selection of cut-rate services and its robust prescription program (a feature that requires a membership upgrade at Sam's). The better cash-back offer makes Costco's Executive Membership the cheapest deal for big-time warehouse shoppers. Both clubs give full refunds to customers unhappy with their shopping experience. Both clubs play the discount game. Special offers are automatically taken at checkout. Costco mails out coupon packets monthly. Mailings from Sam's Club are more sporadic. We saw several "instant savings" discounts when ambling down the aisles at both stores, and members of both retailers can keep track of the latest deals via mobile apps. Both clubs' websites show dozens of current offers, both in store and online. We didn't include such savings in our price comparison, because shoppers can't count on the discounts to be available when they visit the store. But it's worth noting that there were discounts on five of the items we priced at Costco and three at Sam's Club. The savings usually ranged from about $2 to $4. Costco edged out Sam's Club in the 2018-2019 American Customer Satisfaction Index, based on annual interviews with more than 60,000 customers, and is the top-ranked retailer among all department and discount stores. However, Sam's Club earned a slightly higher score than Costco in the 2018 Temkin Experience Ratings, which asked 10,000 U.S. consumers to rate their recent interactions with the two warehouse clubs and more than 300 other companies, from airlines to wireless carriers. A video review from Consumer Reports says Costco rates a bit higher than Sam's in a customer satisfaction survey, but it's unclear when the survey was conducted. We visited both clubs on weekdays when crowds were thin. The Sam's Club location felt a bit more cramped, with more merchandise shoved into a smaller space. Sam's Club stores are, on average, smaller than Costcos: 136,000 square feet vs. 145,000 square feet, according to the companies. One feature we noticed at Sam's and not Costco is self-checkout lanes. Although these can be convenient for shoppers who come in for only a few items, we're not sure how practical they are for the typical shopper stocking up on large, unwieldy items. More of a boon is Sam's Club's free pickup service, which allows members to place an order online and schedule a pickup time at the store. At some clubs, shoppers don't even have to get out of their cars to claim their items. At others, shoppers go inside and check in with their membership card before a club associate retrieves the order. Costco does not have in-store pickup, but it does have a same-day-delivery partnership with Instacart for groceries and household supplies in some metropolitan areas. There is an order minimum of $35 and additional delivery fees apply. There is also a two-day delivery service for non-perishable groceries and household supplies. This one is available nationwide and is free for orders of $75 or more, although prices may be higher than in store. Both wholesale clubs claim fans and detractors. In Cheapism's online poll, respondents posted numerous gripes about service at Sam's Club. For example, Jeff Rigg of Columbus, Ohio, wrote: "Costco employees actually seem interested in helping you and trying to get you checked out quickly. Sam's Club is more like going to the DMV." Although experiences like this may vary from location to location, Sam's Club is dogged by concerns about the employment practices of parent company Wal-Mart, while Costco was lauded as America's Best Large Employer for 2017 in a survey of 30,000 workers conducted by Forbes and Statista. It's been highly ranked for several years and sits at No. 5 on Forbes' 2018 list. Product selection, availability, and quality also affect the customer experience. Costco fans enthuse about the quality of the in-house Kirkland Signature brand, and indeed Costco has more entries than Sam's on our list of store-brand foods that beat their name-brand competitors. A poll respondent with memberships at both warehouse clubs said the produce she buys at Costco always lasts longer. Others asserted that Costco seems to carry more upmarket inventory and a larger selection of healthy and organic products. One Sam's Club advocate stood firm against the tide in appreciating the steadiness of the store's offerings compared with a seemingly ever-changing assortment at Costco (an effort by the company to encourage impulse buys and frequent visits). Several other shoppers value the savings at Sam's Club. Broadly speaking, the range of departments at both stores is very similar, as is the assortment of inventory. In addition to groceries and household essentials, each superstore sells electronics and computers, apparel, home goods, pharmaceuticals, health and beauty products, toys and video games, sports and fitness equipment, automotive supplies, and photo printing. 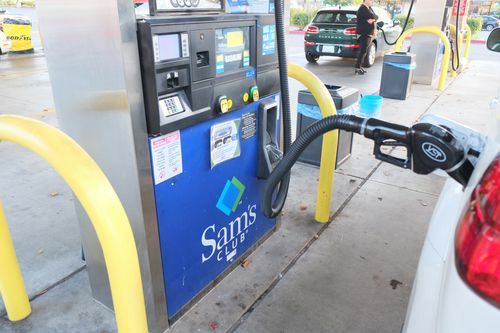 Some Sam's Club and Costco locations also operate gas stations, where prices generally undercut the local competition. Differences between the two are more apparent in the array of available services across departments. In the auto departments at Sam's Club and Costco, a similar selection of tires and accessories carry largely equivalent prices, but the available services vary somewhat. Both stores offer free rotation, balancing, and flat repair for the life of the tires they sell. Sam's edged out Costco in our tire installation comparison in large part because of its 24/7 roadside tire changes, offered to customers for three years from the date of purchase. Both Sam's Club and Costco also have auto-buying programs that offer haggle-free vehicle pricing for club members. Costco offers breaks on car insurance through Ameriprise and additional benefits for executive members, including roadside assistance, lifetime renewability, and glass repair reimbursements. Finally, Costco offers 15 percent off parts, service, and accessories up to $500 at participating service centers. Both clubs offer a large variety of electronics at very similar prices. The cost of a 70-inch Vizio TV, for example, was $999.99 online at Costco and $999 for the same model at Sam's Club. That's a 99-cent difference on a $1,000 TV. The same was true on a Canon EOS Rebel T6 camera bundle (including two lenses, a case, and a 32GB SD card): It was $749.99 at Costco and $749 at Sam's. Both clubs require members browsing online to sign in to see prices for many electronics, which can make comparison shopping onerous. Sam's Club offers members free 24/7 tech support by phone to help with troubleshooting and setup for select electronics. Free tech support from Costco is available from 5 a.m. to 10 p.m., excluding holidays. Costco extends the manufacturer's warranty to two years for most computers, TVs, displays, projectors and major appliances. Both warehouse clubs also offer extended warranty plans on select products through SquareTrade, but Sam's Club's SquareTrade plans include free delivery and setup for TVs over $500. Both stores limit the return window to 90 days for most electronics. Cellphones and other carrier-connected devices must be returned within two weeks to Sam's Club, however. Most large retailers these days have their own credit cards, but these two stores feature an array of other financial services, as well. Costco offers check printing and credit monitoring; home mortgages and refinancing; and discounted home, life, and identity theft insurance. In addition, businesses can take advantage of payment processing, payroll services, phone services, and discounts on productivity software. Sam's Club offers a similar menu of services, including discounted insurance, check printing, and credit monitoring. While the club doesn't provide mortgage services, it does offer discounted accounting services and tax help. Like Costco, it offers business services such as payment and payroll help; it can also arrange discounted small business loans through partner banks. The average shopper probably won't join Sam's or Costco to take advantage of these services, but they're worth checking out. Costco shoppers at any membership level can get between 2 percent and 40 percent off medications when not using insurance coverage for prescription drugs by signing up for the Costco Member Prescription Program. Sam's Club members paying out of pocket for prescriptions must upgrade to Sam's Plus ($100 a year) for benefits that include $4 to $10 generics, up to 30 percent off name-brand drugs, and even a handful of free medications. Both pharmacies provide flu shots, and you don't have to be a member to receive one. In our 2018 comparison of flu shot prices, Costco was the cheapest, at $20, while Sam's Club charged $33.85 for the same shot. Sam's Club Plus members receive 8 percent off immunizations. Both retailers provide optical services at many of their stores. Sam's Club offers a relatively broad set of free health screenings, including cholesterol, glucose, blood pressure, body fat percentage, and hearing tests. Memberships are not required for Sam's health screenings. Costco focuses on periodic osteoporosis, heart, and diabetes screenings at select stores. It also offers free hearing tests, hearing-aid cleanings, and hearing-aid checkups. While Sam's Club discontinued its travel services at the beginning of 2017, many consumers look to Costco for travel planning and discounted travel booking online and over the phone. Members get reduced rates on hotels, vacation packages, cruises, and rental cars. One shopper told Cheapism, "We've always been Sam's Club members, but then we discovered the car rental discount through Costco. The Costco membership is so much more valuable to us now because it makes renting a car so much cheaper on our yearly vacation." Costco's executive members now get a 2 percent reward on travel services, too. 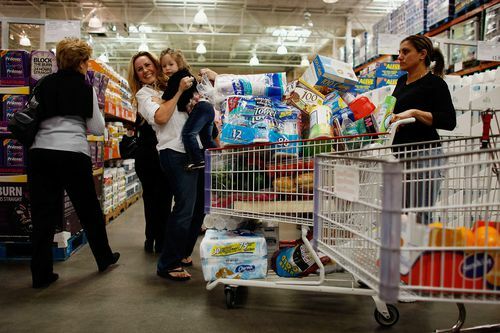 Paying for a full shopping cart can be tricky at Costco. The only credit card the store accepts is Visa (the club's exclusive partnership with American Express ended in 2016). Sam's Club, on the other hand, accepts American Express, MasterCard, Visa, and Discover. Cash, check, and debit are valid options at either club. Non-members can shop at Costco and Sam's Club as guests of a card-carrying member. Both clubs allow members to bring in up to two guest shoppers per trip, but only members are allowed to purchase most items. Neither store sets a deadline for returns of most merchandise, with the exception of electronics (most of which have a 90-day return window). Although both stress that a receipt is preferred, they will attempt to process returns without one. Sam's specifies that refunds may occasionally be made in the form of store credit. Both retailers accept returns of online purchases in-store. Refunds for online orders from Costco include shipping and handling fees. Sam's Club refunds the shipping cost only if the return is the result of an error. Membership - $60 for household or business. - $120 for executive or executive business (2% reward up to $1,000 a year). - $45 for household. Prices - 9 items cheaper by unit price. - Average savings of more than 11%. - 7 items cheaper by unit price. Extra Savings - Offers mailed monthly. - Discounts on dozens of products. - Mobile app displays offers. - Offers mailed several times a year. Experience - Higher rankings in customer satisfaction surveys. - Larger selection of organic and health food. - Higher-end brands and a perception of higher quality. - Same-day grocery delivery and 2-day delivery for non-perishables. - Good selection. Automotive - Tires with free rotation, balancing, and flat repair. - Auto insurance with additional benefits for executive members. - Discounted service and parts from participating service centers. - Tires with free rotation and balancing as well as 24/7 roadside tire assistance. Electronics - Free technical support 5 a.m. to 10 p.m.
- Extended 2-year warranty on many purchases. - Optional third-party protection plans. - Free 24/7 technical support. Business Services - Check printing. - Home and life insurance. - Health plans, payment processing, payroll, and phone services for businesses. - Check printing. Pharmacy - 2% to 40% off prescriptions. - Cheapest generic drugs in multiple price surveys. - Optical services at many locations. - Free hearing tests including hearing-aid cleaning and checkups. - Cheaper flu shots. - 8% off brand-name drugs and 40% off generics with Plus membership. Travel - Discounts on hotels, rental cars, vacation packages, cruises, and theme parks. Returns - No deadline for most items. - Receipt preferred but not required. - 90 days for electronics. - Online refunds include shipping and handling. - No deadline for most items. - 90 days for most electronics. - 30 days for contact lenses, golf carts, and vending machines. - 14 days for cellphones and other connected devices.